Do you dream of achieving a straighter smile but dread the thought of wearing metal braces for months or even years? Invisalign® is an excellent method for improving the alignment of teeth while still helping patients maintain their confident appearance. Please contact Dental & Cosmetic Solutions in Pepper Pike, OH if you’re interested in learning whether or not you’re a candidate for this transformative procedure. Invisalign® uses a customized series of clear plastic aligners that are designed to gradually shift teeth towards their desired alignment. These aligners are comfortable and easily removable, which means that patients can continue to enjoy their diet and brush and floss like normal at home. On average, patients will wear them for 12 to 24 months, and every six weeks, they will attend a brief progress appointment with our doctors so that we can determine whether or not everything is going smoothly. Invisalign® is a system of aligners that is fabricated by Align Technology. The aligners are made of BPA-free thermoplastic. They look similar to teeth whitening trays. The aligners are specifically made for each patient. The Invisalign® system relies on a series of aligners. Each pair of these aligners is designed to move teeth slightly to the desired position. A controlled force acts on selected teeth during the treatment process. Patients should switch to the next aligners after every two weeks. The teeth are straightened gradually over time. Invisalign® aligners are virtually invisible. Patients can undergo the treatment and not let the world know about it. Since the aligners are removable, it is easy to maintain oral hygiene and patients can eat their favorite food without restrictions. How long does it take for the Invisalign® to straighten teeth? 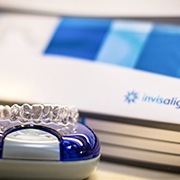 The length of your Invisalign® treatment depends on the complexity of the condition. The treatment may vary from as less as 12 months to as much as 24 months. How to use Invisalign® aligners? The aligners should be worn at least 22 hours each day. They should be removed when eating or drinking anything apart from water and when it’s time to brush and floss. Patients can clean the trays using special system that our team will provide. It is advisable to place the aligners in their special case when not in use. When should I see my Invisalign® dentist? Patients should visit our practice every four to six weeks on average so that we can check the progress of the treatment. Do aligners cause pain and discomfort? Invisalign® aligners are made of smooth plastic that causes no discomfort to cheeks and lips. Discomfort or a sensation of pressure may be felt during the first few days when wearing a new aligner. What are the things to avoid when wearing aligners? Patients should avoid smoking when wearing aligners since it may cause staining. Chewing gum with aligners on should be avoided as it can cause the gum to stick to the appliance. Alcohol consumption in high levels should also be avoided. The patient may be advised to wear retainers after the Invisalign® treatment just to make sure that the teeth do not shift back to their previous positions. Our dentists will explain this information in more detail at the end of your orthodontic journey. Can any dentist perform Invisalign® treatment? Invisalign® treatment can be performed only by trained providers!